In Delaware Bay, the spawning of several million horseshoe crabs (Limulus polyphemus) coincides with the arrival of migratory shorebirds that feed on their eggs. High horseshoe crab spawning densities and resulting high egg densities drive egg availability and predation rates. At high spawning densities, female horseshoe crabs perturb previously deposited clutches causing eggs to rise to the sediment surface (surface egg densities average 100,000 eggs m− 2). At the surface (0–5 cm), the eggs are quickly depleted by shorebirds and other predators. 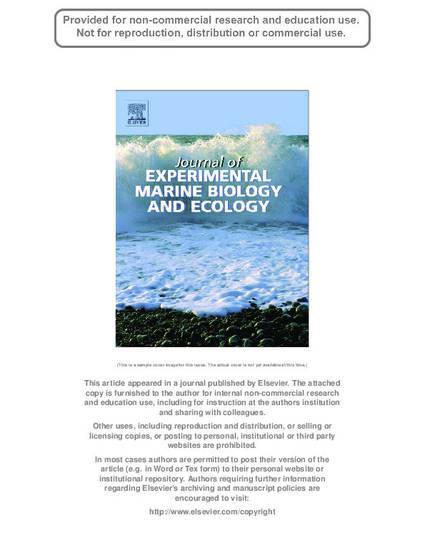 This interaction between egg density and egg predation has not been explicitly explored on beaches with low spawning densities such as on the Connecticut (CT) shore of Long Island Sound (LIS). Spawning indices in LIS (range: 0.002 to 0.02 females m− 2) are two to three orders of magnitude less than in Delaware Bay (0.7–1.0 females m− 2). Given the low spawning density and correspondingly low subsurface egg density (x = 1.5 eggs cm− 2), we predicted that the frequency of egg predation would be rare. A series of exclosures was constructed on two known horseshoe crab spawning beaches to test the frequency and rate of predation on horseshoe crab eggs. There was no significant difference between egg masses initially placed in artificial nests and recovered at the conclusion of each experiment. While shorebirds were observed probing sediments within and outside of experimental plots, eggs were never observed at the surface during this study. Foraging by shorebirds for buried eggs may be energetically prohibitive given the lack of eggs on the surface and the low subsurface egg densities on CT beaches in LIS (range = 0.6–2.4 egg cm− 2). Limited egg predation by fish was observed but tidal scouring of eggs buried below mean tide primarily drove egg availability for these predators. We conclude that horseshoe crab egg predation is a rare occurrence in Connecticut due to low egg density as a direct result of low spawning densities.